"I recently was asked by the Technology Supervisor to assist in preparing for the NJ Smart submission. My job was to correct all errors before the state submission deadline. I had been working on this for weeks prior to the submission snapshot. Aroun..."
"Realtime has fulfilled all of our district's student administration needs. It's internet based capability is very popular with our staff because it gives them the ability to enter and retrieve information both in the workplace and at home. 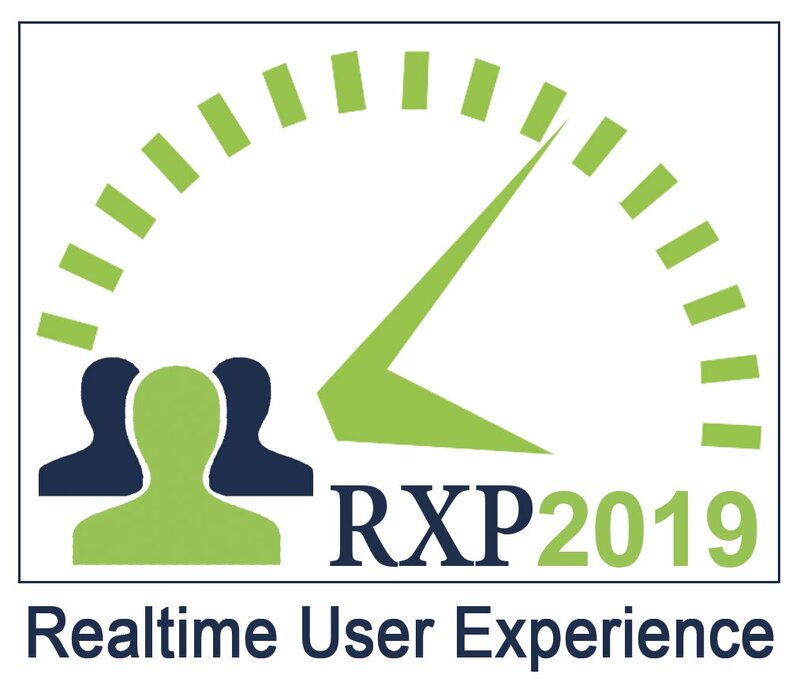 The new..."
RXP2019 - Fresh Workshops, Realtime Experts, Experienced Users Community, and a Relaxed Environment - everything you need to make sure you are using Realtime to the max! Whether you are one of our "would not miss it" attendees, "been there, done that" users or "there is not enough time in my day" users... you’ll want to attend our Realtime User Experience 2019! collective experience of our users. New features coming up in 2019-2020.
Review features you may have missed this past year. Attend selected breakout workshops (learning from Realtime experts). You don't want to miss this opportunity - Designed to give you the highest level of value in the shortest amount of time. Your district has gathered student data elements such as assessments, grades, attendance & discipline; Realtime's new Data Analysis tool allows you to design a custom view to display the data elements you want to see, with optional thresholds. Once saved, distribute the new custom view to specified staff, allowing them to view the results for their connected student population. Join us for a first look! Are you using all the customizing tools of the lesson planner and administrative approval process? Would you like to see how to layer units over daily lessons? Those topics and the introduction of a curriculum scope and sequence tool will be presented. See the value you can get from displaying different data elements within the IEP; standardized test scores, attendance, grades & discipline data. Get help preparing for Oct 15th Submissions by validating NJ Smart Special Ed data and collect Medicaid & SEMI Reporting data through the updated Service Provider Log. Join us for a workshop on Realtime’s exciting, new Analytic features which includes; Performance and Historic Testing Analytics based on the PARCC 2018 Scale Score Ranges - Attendance Performance Analytics based on Attendance - and building your own district analytics with our new Analytic Calculator. Communication with Parents and Students is the theme of our Portal workshop. Features like Portal Requirements, Attendance Warnings, Parental Attendance Reporting & Tips on Design will be discussed during this information packed workshop. If you are responsible for scheduling students, attend this workshop to discuss Course Requests, Analysis, Master Schedule Builder and Executing the Scheduler as well as these new features; Student Pairing, Testing Pre-Requisites and Linked Courses. Join us for helpful tricks to optimize your school's schedule. Learn how to use multiple student data elements in Realtime (assessments, grades, attendance, discipline) to identify At Risk students and then place those At Risk students into tiers with the appropriate interventions and support services. Use our Progress Monitoring tool to store the results of interventions, and then print graphs displaying those results against the desired target's score. With the advent of SCEDs and standards based report cards Elementary scheduling is now a requirement. We will cover the necessary maintenance, as well as the tools to quickly edit student schedules for the primary grades with a focus on the Homeroom Scheduler, which is an efficient alternative to individualizing schedules. Let's spend time together discussing how to keep up with state requirements. Topics will include NJSmart submission and tools to help with this process. PCG will join the group at the end of the session for a short presentation and to answer questions. Use the individual meeting location links above to register for the specific date and select your workshops. All locations have the same format and agendas. You can register for more than one location if needed. We are happy to announce that there is NOT a limit on the number of attendees per district. Please register as soon as possible! The deadline for registration is Friday, May 17th. We look forward to spending time with you. Hope to see you there! 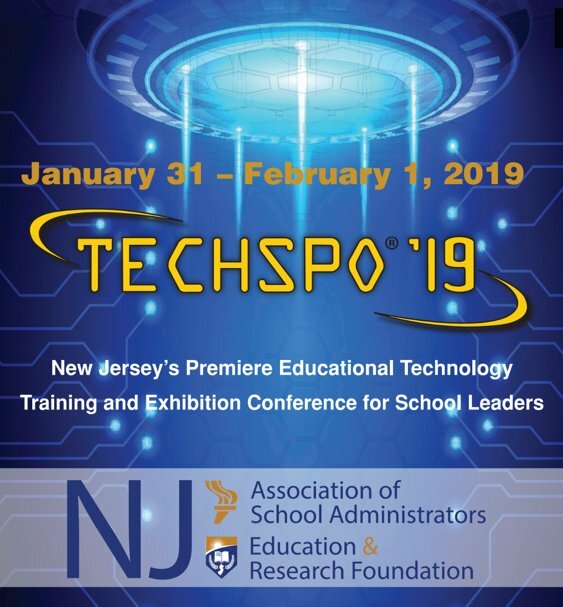 Realtime IT Inc will be at Techspo 2019, come visit us! January 31st to February 1st. We love it when customers want to know more about Realtime and share their hands-on experience. That was Joe Brislin's (Hawthorne's Technology Coordinator) idea when speaking with Scott Hughes (Wood-Ridge's Technology Coordinator). A few months ago, they created the "North Jersey Realtime User's Group" Google+ Community, and soon after had their first official meeting. Are you interested in being involved by sharing ideas and learning from other Realtime Users? It's easy. Request to join the Google Community site below and make time to attend their next meeting. When: November 29, 2018 at 9:00 - 11:00 am. The event will be held in the Media Center on the 2nd Floor. When you enter the building a security guard will assist you with the location. There is only street parking. Larry Ullman, Realtime's Co-Founder, and Mario Tirondola, from Realtime's Support Team, will be joining the discussion on Scheduling. RSVP by going to their site noted above. We hope to hear that South and Central Jersey User's Groups will be forming. We will keep you updated. Whether you are one of our "would not miss it" attendees, "been there, done that" users or "there is not enough time in my day" users... please consider making the time in your schedule to attend our 2018 User's Group! In this community, you can get real-world advice, ask questions, learn best practices, share stories, and find out if you are using everything that is available to you in Realtime! You can benefit from the collective experience of our users and meet some of our amazing customers in the process. During the General Session, you will be the first to hear about the new features coming up in 2018-19 and a review of features you may have missed this past year. And then you will be attending your selected breakout workshops. These workshops offer a great opportunity for a roundtable discussion with district users and our Realtime experts. This is where you can share and hear from others who have the same interest. Our User's Group event will be held at hotel conference centers allowing for simultaneous workshops, more attendees, easy parking and a relaxing environment for everyone to focus on their topics and spend time with the other attendees. Sounds fun, right? See below for the details on the topics & times. You don't want to miss this opportunity! This event has been designed to give you the highest level of value in the shortest amount of time. How is your district managing staff evaluations? Would you like to ask other districts how they are accomplishing this task? Attend this workshop to discuss and review the powerful features designed to save time & paper shuffling. Demonstration of the new Service Provider Calendar which is a great tool to build your service provider plan and schedule your students' services from both IEPs and 504 documents! Learn SEMI tools and best practices from Realtime experts and your peers. If you are interested in how a teacher's gradebook can support skill/standards grading, our recent enhancements to the product or you would simply like a comprehensive overview to help your district better use this tool, register for this session! Are you responsible for scheduling a building and want to learn best practices? Attend this workshop to understand the process of course selection, master schedule building and operating the scheduler with many helpful tips & tricks to optimize your school's schedule. Learn how you can use multiple student data elements in Realtime (test scores, grades, attendance, discipline) to identify At-Risk students. At-Risk students can be placed in tiers with options to assign interventions and support services. Register for this session so we can discuss how this tool will provide management oversight and administrative reporting. Let's spend time together discussing how to keep up with what the state requires. Topics will include NJSmart submission and tools to help with this process. PCG will join the group at the end of the session for a short presentation with Q & A. We are happy to announce that there is NOT a limit on the number of attendees per district. Please register as soon as possible! The deadline for registration is Friday, May 19th. We truly look forward to spending time with you. Hope to see you there! 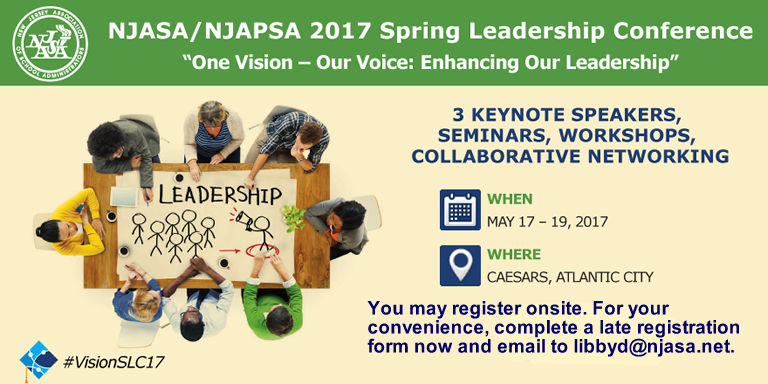 "One Vision - Our Voice: Mindful Leadership"
For more information about the Spring Leadership Conference click here! Jan 25th-28th - Harrah's Resort, Atlantic City! Visit us at booth 304/306 and demo the NEW Parent Portal Mobile App! Realtime will be attending TECHSPO 2017! 39th Annual ASAH Conference "Making Dreams Happen"
Friday November 4th, 2016 8am to 3:30pm.